The Town of Mendocino was established in 1851. For the first 120 years, the Community did not have a public wastewater collection system, and to this day does not have a public water system. Wastewater facilities consisted of cesspools, septic tanks, and some small private collectors, which discharged untreated wastes over the bluff directly to the ocean. The residents’ water source is still from private wells. On January 19, 1971, Mendocino City Community Services District was formed as a first step in solving the community’s wastewater and water problems. Since Mendocino had limited financial resources, the wastewater treatment plant was given first priority. Public hearings were held, news articles were published, a citizens committee was formed, and poster and essay contests were conducted by elementary and high school students to accurately inform the residents of the important environmental, esthetic, technical, and financial aspects of the project. Through the efforts of citizens, business owners, students, and the original MCCSD Board of Directors the general obligation bonds for the treatment facility were approved by an 86% “yes” vote. The treatment plant and the collection system went online in 1975, only four years after the District was formed. MCCSD treats approximately 35 million gallons of wastewater per year. The plant has the capacity to treat up to 300,000 gallon of water a day. The District operates an extended aeration activated sludge treatment plant. The activated sludge wastewater treatment process is a biological process that uses microorganisms to decompose wastes. The microorganisms feed and grow on waste particles in the wastewater. As the organisms grow and reproduce, more and more waste is removed from the wastewater, leaving the water partially cleaned. 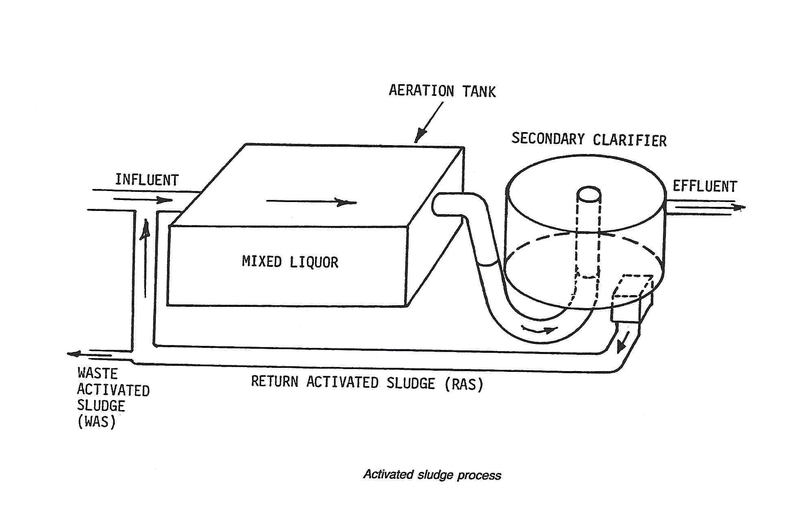 The organisms feed on the wastewater in the aeration tank (see diagram). After the aeration period, the wastewater is routed into a settling tank or clarifier. The organisms are allowed to settle to the bottom of the clarifier, and the treated water, called effluent, is chlorinated and discharged from the plant. The organisms that have settled to the bottom of the clarifier are returned to the aeration tank, so they can feed on the new incoming wastewater. Severe water shortages continue to exist in Mendocino during the dry summer months for residents with marginal wells. In the past twenty-five years, two droughts have affected Mendocino residents, the first from 1976 to 1977 and the last dry period lasted from 1986 to 1994. In 1990, the MCCSD took over groundwater management authority from Mendocino County. The District has developed a groundwater withdrawal program, which limits groundwater extraction. The primary tool of the Groundwater Management Plan (GMP) is the Groundwater Extraction Permit Ordinance. The Ordinance is used to establish groundwater allotments, which are based on the size and type of development on a parcel. A hydrological study must be performed prior to issuance of a groundwater extraction permit for new development, to insure that there is adequate water for the development and that the proposed extraction will not adversely affect neighboring wells. The GMP allows local government to mandate the amount of naturally occurring groundwater that can be withdrawn from the Town’s aquifers on a sustained basis. The purpose of the program is to prevent depletion of the Town’s groundwater by not exceeding the aquifers safe yield, which is the amount of water that can be pumped regularly and permanently without dangerous depletion of the groundwater storage reserve. The District’s current groundwater management policies are to promote water conservation measures, to increase the use of reclaimed water to reduce groundwater extraction, and to collect and analyze information on groundwater conditions within the District boundaries to assist the Board in the groundwater management decision-making process. MCCSD has had a recycled water program since 1977. A new reused water system was constructed at the treatment plant in 1997. This system pumps tertiary treated effluent from the wastewater plant to the Mendocino High School. This water is used to irrigate the school athletic fields. An average of 2 million gallons per year is transferred to the school. The fields are now in excellent condition, in part due to the reused water, and the reused water has helped reduce the demand on the groundwater resource.